5 セッション層 名前付きパイプ, NetBIOS, SAP, Half Duplex, Full Duplex, Simplex, SDP Sockets. 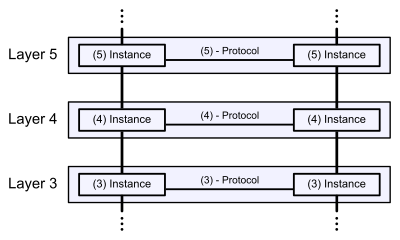 Session establishment in TCP. SIP. (Not a separate layer with standardized API. ), RTP ASP, ADSP, PAP ISO/IEC 8327, X.225, ISO/IEC 9548-1, X.235 NWLink DLC? ^ ITU-T Recommendation Q.1400 (03/1993), Architecture framework for the development of signalling and OA&M protocols using OSI concepts, pp 4, 7.